Life with a large family can sometimes be messy; at my house it seems like the kitchen always needs a little help! The kitchen is the heart of the home, the place where we gather together, have our best conversations and of course, store our food! 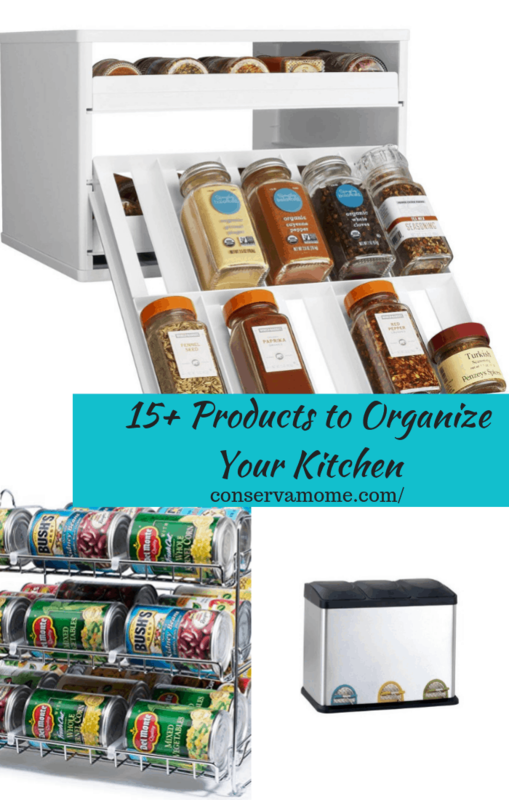 I found 15+ Products to Organize Your Kitchen that have been such a big help for getting things in order at my house that I know you are going to want to check them out. I am a participant in the amazon affiliate program; if you make a purchase I will earn a small commission at no cost to you. This list has something for every budget, but best of all, none of these suggestions are over $50! Despite their affordable prices, all of these kitchen organization tools are really helpful items! Which of these 15+ Products to Organize Your Kitchen do you think would be the most helpful in your life? I am crazy about the 3 Tier Kitchen Baskets for Produce. They make keeping fresh foods handy and they look great. The stackable can organizer is a must have too! It really makes storing canned goods easy and presentable! Have you been watching Tidying Up on Netflix? Has it inspired you to start getting your house organized? I will admit, I have watched a few episodes and felt inspired to get started! If you are looking for more ways to get things in your life in order you won’t want to miss my clever storage ideas or these 20+ Back to School Organization Ideas.